Lost amid the snow…I remember the smile on my face, woken from a warm dreamy land,opening the shutters to find a magical snow covered world outside my window. A smile of pure contentment of feeling free, and happy of seeking pleasure in the magical world of natural beauty. Everything that’s covered in snow is new again , pristine and glistening. The single rose, her everlasting beauty even in the coldest of temperatures, her petals iced over her thorns unseen…the light in my garden covered in icicles a golden glimmer amongst a snow covered path…Lost amid the snow. Have you memories of today’s prompt…Lost amid the snow. Join in…it maybe a poem, a photo or something creative… join in the fun of sharing your Christmas memories. 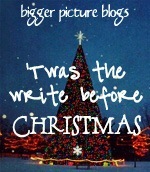 Link up to Bigger Picture Blogs:’Twas the write before Christmas. A totally different landscape covered in snow…even the farm machinery have new life! Nothing is more magical than a rose among snowflakes. How beautiful! Hi Alita…so true, roses are beautiful covered in snow! I was amazed at how it survived the cold temp. This is lovely — images so clean and white and pure. Thank you for sharing your memories! Hi Sarah…everything looks so different covered in snow..thanks for calling by! Beautiful pictures. I particularly love the lamppost. The garden looks so different with it’s winter blanket! Very pretty writing and pics, Yvette. It’s a joke between me and my family….I’m rugged up and doing snow angels and they’re always swimming in the pool on Christmas day! Goodness, those pictures are just beautiful! I love the way the snow gives everything a beautiful white covering. Hi Hyacynth…thanks for calling by…photography has been a part of my life for a while, but it’s always a special time when the snow falls…every photo captures a different light and has a eery mystical feeling to it! What a super idea Yvette and I am with Cindy as all of my Christmasses have also all been sunny and hot, hot, hot. Sometimes I long for those hot Summer Christmas’s!! Snow is magical isn’t it? Thanks for sharing the photos, the scenes are lovely. We have been threatened with some snow today, but so far it is a no show. After reading your post I am now crossing my fingers that we will be dusted with some of the magical white stuff! 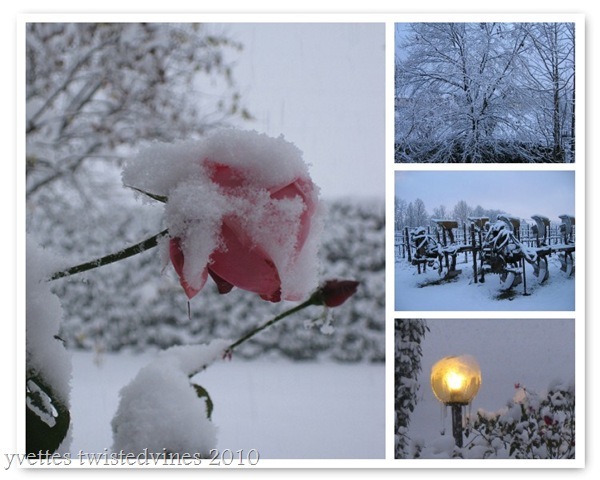 Love the rose covered with snow~ such a contrast!